Harrogate Christmas & Gift opens its doors at 9am today and visitors to the show are in for a treat as there are more exhibitors in 2018 than there have been for over a decade. The diversity of products on show has also increased dramatically and among the Christmas trees, decorations and tinsel you will find ride on toys, personalised books and gifts, candles and diffusers, novelties and sweets and much much more. The Greatest Christmas Awards organised by Garden Trade News will not be taking place tonight as in previous years, but has been replaced with an exciting BIG NIGHT OUT, at the Old Swan hotel with top comedians, great food and dancing. More information about the event can be found in the show catalogue or online at www.harrogatefair.com – tickets are available from the Organiser’s Office at the entrance of Hall A. The Betty Hula innovative range of natural skincare products takes a contemporary twist on traditional recipes and combines stylish, hand-finished mainly vintage glass packaging to bring variety and individuality to the skincare and gift market. Eye-catching on shelf, with most products and box sets retailing at under £20, it fits the general gift budget perfectly. The range includes its best-seller – a natural anti-bacterial range of hand creams which won ‘Best Everyday Hand Cream 2017. Betty Hula products are laced with a tantalising selection of exotic Hawaiian inspired scents and are made in Yorkshire utilising natural ingredients. The Kilted Christmas Tree Company is a Scottish family business which produces fresh, quality Christmas trees. 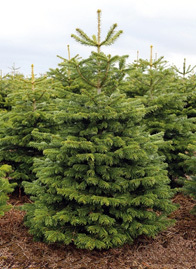 It grows Nordman Fir, Fraser Fir and Norway Spruce varieties which are available in a number of sizes. The company also supplies fresh, hand-made wreaths in a wide selection of designs, or plain to decorate yourself. The wreaths are made with quality foliage which is also supplies and in addition to its fresh products, the Kilted Christmas Tree Company is also the exclusive supplier of Mitchell wreath rings and clamp machines in the UK and Europe.